FoxP2 also plays an important role in speech in humans. Stephanie White, a UCLA professor of integrative biology and physiology and senior author of the study, thinks FoxP2 and the changes it causes could be a part of the molecular basis for vocal learning. In both humans and birds, cells process this gene in a way that produces both a full-length protein and a shorter version of the protein. The long version regulates other genes; what the short version does remains a mystery. Humans with a mutation in the long version have problems with their speech. To prevent this decline in Area X, White's research team used methods similar to human gene therapy to insert a version of FoxP2 in male zebra finches. After doing so, when the birds sang, instead of their FoxP2 levels declining, the levels remained high. This uncoupling of FoxP2 levels from the birds' singing impaired their song learning. "In a sense, this may be the molecular version of 'practice makes perfect,' and why one needs to repeat motor skills over and over to learn them, rather than just having someone tell you," White said. Few treatments for language impairments have been developed, White said, because scientists have only a poor understanding of the molecular basis for vocal communication. The findings of this study could lead to the creation of new treatments for speech problems in people, including children with autism and people with mutated versions of FoxP2. White is interested in human behavior, but said humans are difficult to study at the cellular and synaptic level. Through trial-and-error practice during a critical period, the birds develop a song suitable for courtship. Songbirds, much like in humans, have a critical period in youth when they are best at learning vocal communication skills. In birds, this is when they learn a song they will use later in life as a courtship song. In humans, this is when language skills are most easily learned. After this critical period ends, it is more difficult for people to learn languages, and for certain bird species to learn their songs. 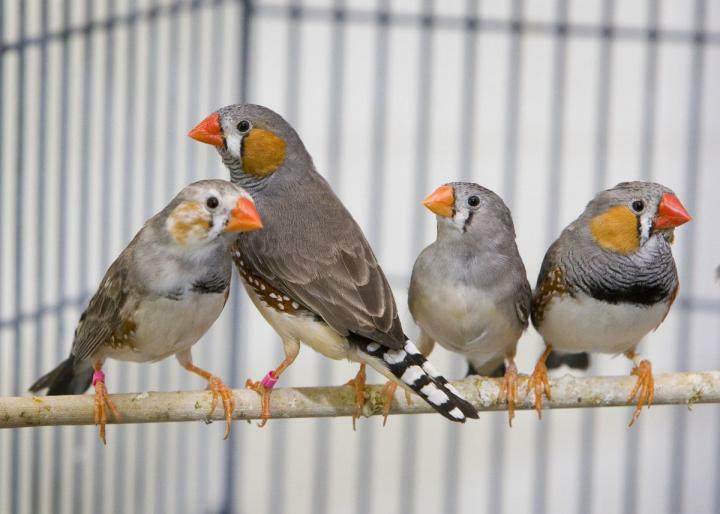 Male zebra finches learn to sing a courtship song from 35 to 100 days after hatching. White and her colleagues set out to identify how FoxP2 affects thousands of other genes in zebra finches before and after the critical period for learning closes. "We found sets of genes in young birds whose levels change when they sing, and are linked to learning," said White, who is also a member of UCLA's Brain Research Institute. "These patterns disappear in older birds. Many of these genes are essential to human language development." "We identified networks of genes involved in critical-period vocal learning, including human speech-related genes," White said. "Pharmacologically targeting these pathways could lead to the development of new drugs to treat communication deficits in humans." "It's not that all the genes (or instrumentalists) became loud or became quiet; it's that they change in a coordinated way," White said. "We refer to these as 'suites of genes,' and one of these suites of genes is highly correlated to learning in young birds." Co-authors are Xinshu Xiao, UCLA professor of integrative biology and physiology; Zachary Burkett, a former member of White's research team; Nancy Day, a postdoctoral scholar in White's laboratory; Todd Kimball and Caitlin Aamodt, graduate students in White's laboratory; Jonathan Heston, a former member of White's research team; and Austin Hilliard, a former graduate student in White's laboratory.